With SLFP joining with the UNP to form a national government, a fresh struggle is looming in Parliament for the post of the Opposition Leader. JVP Leader Anura Kumara Dissanayake who is representing the Democratic National Alliance (DNA) in Parliament said he is planning to inquire from the Speaker Chamal Rajapaksa about his stance on the matter when Parliament meets today. Meanwhile, constituent parties of the UPFA which is led by the SLFP are also up in arms against Nimal Siripala continuing to hold the position. Leader of the National Freedom Front Wimal Weerawansa and Leader of the New Democratic Front Vasudewa Nanayakkara demanded that de Silva should step down paving the way for the Leader of the Mahajana Eksath Peramuna Dinesh Gunawardena to be appointed to the post. What goes around, comes around. – Karma! A good idea to overcome this impasse will be to create three Deputy Prime Ministers and offer one each to Nimal Siripala,TNA Leader Sambanthan and SLMC Leader Rauff Hakeem. They all should enjoy all the rights and privileges as those of the Prime Minister. THAT WILL BE REAL YAHA PALANAYA. Further when Ban ki moon hears about this move he is sure to tell the whole world to take Sri Lanka as a model for National Reconciliation and Inter Communal Harmony. Soon Sri-Lank will be end up like in Tailand. Political discards -Wimal, Vasu, Dinesh,Gammanpila tried to cling on to MR for their survival. But Mr. has finally declared that he will contest only under the SLFP symbol. Now they are desperately tying to push Dinesh to the opposition leaders seat. 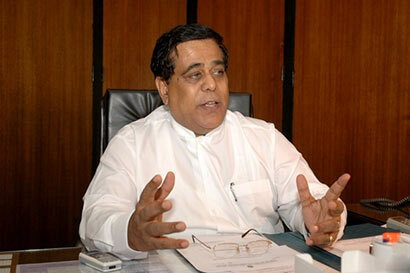 May I ask Mr. Wickramarathna, (1) whether CBK is in the line of ‘political discards’ or not, and if not why? (2), If she is where about the ‘mummy’ fits in the line.